It's hard to believe that less than a decade ago Tina O'Doherty, who's only 5ft 1in tall and is now a petite size 12, weighed almost 19 stone. But Tina, now 33, lost almost eight and a half stone in just a year – and has managed to keep it off for an incredible ten years through a combination of a good exercise programme and a healthy, portion-controlled diet. “I had to lose the weight for health reasons alone, although getting slim has also done wonders for my confidence,” says businesswoman Tina, who lives just outside Edinburgh. “I started by eating very healthily. I ate only sensible foods and cut down to smaller portions. I would have bran flakes for breakfast, then maybe a soup for lunch. “For dinner I'd still have meat, veg and potatoes, but I would eat a lot less than I used to. I'd cut down the size of my portions and have a much smaller plate. Before she started eating healthily, Tina had a very bad diet. “I rarely would eat regular meals. I'd skip breakfast and have snacks instead, such as crisps and chocolate bars,” she says. Tina's weight problem was compounded by the fact that she suffers from Polycystic Ovarian Syndrome, which causes a hormonal balance and means that weight goes on a lot easier, and is considerably harder to shift. 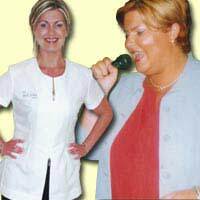 So she began going to a special inch-loss gym to help the pounds come off. “I went to this clinic in Cork, where I was living at the time, where they had machines to tone you up. For about four months I went three or four times a week, and immediately I saw an improvement,” she says. “Immediately I saw an improvement, and I kept it up. All I had to do was lie on a bed and the machines did the work for me. Despite that, Tina says that maintaining the weight loss was hard. So she bought one of the machines to use at home, then decided to open up a clinic part-time to help others as well. She now has five clinics throughout Scotland. The food hampers are easy to love because they don't involvement replacement foods such as shakes. Instead, they give dieters smaller portions of healthy meals that taste good – and are good for them. Included are cereals, smoothies, soups, salsa dips, fresh fruits and vegetables, juices and complete dinners, including yummy entrees such as beef in a thyme gravy sauce, lamb hotpot or fresh salmon. Dieters can purchase either a week's or month's supply. “Having a smaller plate helped me enormously when I was dieting because there is only so much you can put on it at one time,” she says. Tina says she now feels great. “I have a lot of confidence back in myself, and helping people as well is absolutely fantastic,” she says. “We now see about 1,000 clients a week, and they genuinely are very happy. Some come just for the inch loss, now people come for the portion controlled hampers too. They make working people's lives a lot easier, especially working mums, and people are enjoying the food too.